Room diffusers are a stylish way to add a luxurious scent to your home. Unlike ugly chemical spray bottles or plug in the wall oil warmers, diffusers distribute your choice of scent to the room by traveling up wooden rods that sit in a decorative bottle. With a few household items, you can easily make your own for a fraction of the cost of store-bought diffuser kits in just a few minutes. Add ¼ cup of baby oil, or any other unscented or lightly scented oil such as almond, mineral, safflower, or jojoba oil into to a small bowl. Next measure out 3 tablespoons of either rubbing alcohol that is at least 90% isopropyl or vodka and pour it into the bowl. 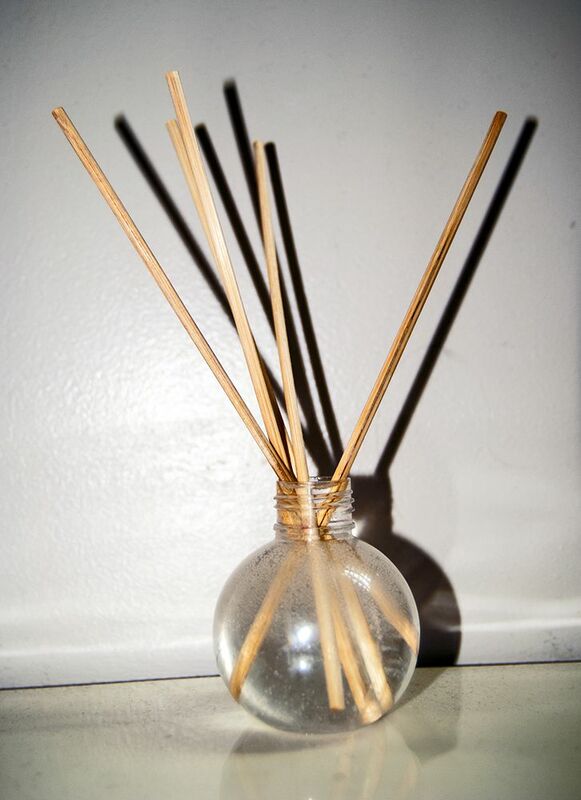 The alcohol will help the scent flow up the diffuser rods better, so invest in some inexpensive alcohol for this craft. After carefully add 20 to 25 drops of your favorite essential oil scent to the bowl. Find a small vase or glass bottle for your room diffuser. You want a bottle that is slightly wider at the base and has a small opening at the top to prevent less evaporation of the liquid. Once you have found a suitable vase or glass bottle, place the funnel into it and pour the essential oil mixture into the vase so that the bottle is ¾ filled with the scented oil mixture. Place three to six wooden skewers or reeds into the vase. Diffuser reeds do function better than wooden skewers, but wooden skewers still work and are much more affordable and can easily be purchased at the grocery store so the choice is up to you on which to use. Depending on the size of the vase, you may wish to cut the reeds with scissors or a utility knife so that they only stick out of the vase a four to six inches for ascetic reasons and for increased stability if you have a vase that is not too sturdy. If you are using wooden skewers cut off the spiked end as you will need to rotate the skewers and may find the spikes at the end of the skewers to be a safety risk especially around young children. You will need to check on the quantity of liquid in the vase every month and add more as necessary. If there still is liquid inside make sure to use the rods to mix the liquid around in the vase. Rotate the diffuser rods so that the dry end goes into the liquid, and then back out of the liquid the following time. You will continue rotating the rods each month, until you notice they no longer diffuse the essential oil fragrance anymore and then they will need to be replaced, typically after four to six months. If you don’t have a suitable vase try recycling one of your glass bottles such as the small bottles used for juice or an old perfume bottle.